It's time for another episode of 205 Live on the WWE Network! 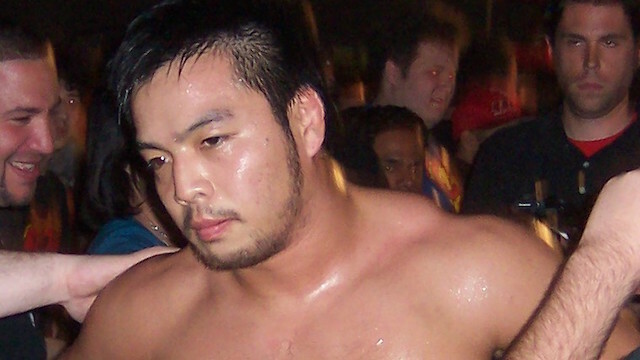 Tonight is the long-awaited debut of Hideo Itami to the cruiserweight roster. Many within the division have been commenting on the former NXT superstar's upcoming debut, and Itami will surely make an impression. Who will be his first victim? Hit F5 or refresh for the latest updates while the show is in progress! We start tonight's show with clips from Monday Night Raw last night where Cedric Alexander faced and defeated Drew Gulak to become the next #1 contender for the Cruiserweight Championship. Drew Gulak wants a rematch tonight on 205 Live. Vic Joseph and Nigel McGuinness talk about how dangerous Hideo Itami can be in the ring. Kalisto is the first man out ready for a tag team match. On 205 Live last week, after Kalisto defeated Jack Gallagher, Brian Kendrick attacked the luchador until another masked cruiserweight - Gran Metalik - came to the rescue. Kendrick and Gallagher come out next as their opponents. Kendrick: "Wow, look who it is! It's the King of the Ropes, Gran Metalik. I don't know about you Jack, but I sure am surprised to see Metalik out here. Because Metalik, we had no problem with you, that is until you decided to stick your nose in our business!" Gallagher: "Mr. Metalik, just ask your compadre Kalisto what happens when you stick your nose in our business. It's like a tightrope walk, and I do hope that after you've slipped and fallen, the consequences of helping your little lucha friend feel worth it." Kalisto and Kendrick start the match, they lock up, Kendrick takes an arm, Kalisto rolls through to counter into a hammerlock, Kendrick reverses it into a top wristlock taking him down to a knee, Kalisto cartwheels out and they're at a stalemate. Kendrick kicks him in the midsection, chops him, Kalisto chops back, kicks to the legs, Kendrick with a forearm, backs him into a corner, chops him on the chest, Kalisto comes back with some kicks and a headscissors takedown. Metalik tags in, kicks Kendrick in the arm, Irish whip reversed, flips over onto the apron, kicks him in the head, walks the ropes, lands a crossbody, backflips, blocks a punch, picks him up on his shoulder but Kendrick fights out. Gallagher tags in, whips Metalik into a corner, Metalik walks the ropes, connects with a missile dropkick, kicks Kendrick off the apron, then both Metalik and Kalisto lands flip dives onto both men! Back in the ring, Gallagher trips Metalik up hanging him in the tree of woe, dropkicks him in the knee, Kendrick with a cheap shot, then Gallagher works on the left knee with kneedrops and leglock. Metalik tries to fight him off but Gallagher holds on, Kendrick tags in, dropkicks him in the knee, then puts him in a single-leg Boston crab. Metalik tries to wiggle free, Kendrick stares at Kalisto as he drops down on Metalik's knee, Metalik fights him off, but Kendrick gives him a back body drop and gets a 2-count. Gallagher tags in, knocks Kalisto off the apron, knees Metalik in the knee, Kalisto rushes the ring in anger but gets held back. Kendrick tags in, wraps his leg around the rope, sets him up on the top turnbuckle, Metalik tries to fight both men off, Kendrick is up on the top rope as well, and Metalik slams him down with a bulldog from the top! Gallagher tags in, grabs Metalik's leg to stop him, Metalik fights him off and makes the hot tag! Kalisto takes Gallagher down with a springboard seated senton, grazing superkick to Kendrick, kick to Gallagher's midsection, counters a double hiptoss with armdrags, kicks Gallagher in the gut and delivers a basement 'rana. Gallagher blocks Solida Del Sol, Kalisto kicks him, kicks Kendrick off the apron, hits a corkscrew shoulder block on Gallagher from the middle ropes, and hits Solida Del Sol! Kendrick breaks the count and starts stomping on Kalisto so much that the referee calls the match off. WINNERS by DQ: Kalisto and Gran Metalik. Kendrick holds up Kalisto, Gallagher hits him with a hard headbutt, and they launch him into the ringpost. They turn their attention to Gran Metalik, Gallagher pummels him, Kendrick moves the stairs around, Gallagher kicks him on the leg and drags him towards the stairs. Gallagher uses his umbrella to hold down Metalik while Kendrick dropkicks the stairs into Metalik's leg. Finally several referees come down to kick them out from ringside. Backstage, Cruiserweight Champion Enzo Amore is in the locker room complaining that tonight was supposed to be a celebration, but now he has to do damage control because of his 'Zo Train. "Just look at you's!" Gulak steps up and takes the blame, Daivari agrees with him, and Enzo questions him on it. Gulak vows to make it up to Enzo by beating Cedric Alexander tonight and says a better 205 Live begins in earnest when he "utterly annihilates" Alexander, then storms off. Enzo: "That's what I'm talking about. You're on The 'Zo Train. Why don't you try showing some freakin' passion?" Tomorrow night on NXT we will get two championship matches in one epic night. It's time for Hideo Itami! AND HEY, his opponent? Former WWE superstar Colin Delaney! They lock up, Delaney with a side headlock, Itami escapes, hits a back kick, kick to the chest, kick to the back, then shouts "Respect me!" Itami chops him, Irish whip reversed, sticks a boot up, tornado neck drape on the top rope, flying clothesline from the top, quick strikes from the left and right, hesitation dropkick in a corner, then the original innovator of the finisher hits the GO TO SLEEP for 3. WINNER: HITEO ITAMI. We go back to 205 Live last week where we saw tension within The 'Zo Train. We thought Enzo was going to have a match with Tony Nese, but it was only a "learning experience" for him to be taught about speaking out against Enzo. Backstage, Dasha interviews Enzo about the attack on Nese. He says it was just a learning experience, but before he can continue Cedric Alexander shows up. Enzo mocks him for needing a second chance and says he always gets the job done on his first chance. Cedric tells him that if he believes in that then he wouldn't need The 'Zo Train, says he lives in a fantasy world, and in reality there's really only one word to describe him. Enzo: "He's right: Champion." We get a commercial for Monday Night Raw this Monday night where John Cena will make a live appearance. Drew Gulak comes out for his match along with Enzo Amore. Enzo: "My name is Enzo Amore, and I am a certified G and a bonified stud, and you can't teach that. Bada-boom, realest champ in the room, how you doin'!" The crowd starts chanting before Enzo can say more, so instead he hands the mic to Gulak. Gulak: "No chanting! Thank you, Mr. Amore. Ladies and gentleman, normally I'd come out here with a very well prepared PowerPoint Presentation usually about how to make a Drewtopian 205 Live by removing low-class high-flyers like Cedric Alexander. But as the saying goes, there's a time for Clip-Art and there's a time for action. Now make no mistake about it, you cannot be taught how to be a certified G, you cannot be taught how to be a bonified stud, but Mr. Amore - my mentor, my best friend - you have taught me that NOW is the time for action. And the only PowerPoint that's gonna happen tonight is when I overpower that boneheaded Cedric Alexander and drive home the extra salient point that NOBODY MESSES WITH THE 'ZO TRAIN!" The bell dings, they circle around each other, they lock up, Gulak backs him into the ropes, and they have a clean break. They lock up again, Alexander backs him into the ropes this time, and another clean break. Another lock-up, in the ropes again, Gulak kicks him, elbow to the back of the head, Alexander chops him, Gulak smacks him with a palm strike and stomps a mudhole in him. Alexander hits a hard forearm, Gulak fires back, delivers a snap suplex but only gets a 1-count. Gulak hits elbow drops to the left leg, twists his leg, Alexander refuses to quit, Gulak hits a kneedrop on the knee then applies the leglock. Alexander gets to his feet, fights him off, Gulak with another palm strike, Alexander rolls under a clothesline, backflips into a headscissors and dropkicks him. Alexander chops him on the chest, hits a European uppercut, forearm, Gulak hides in a corner, clean break, Gulak kicks him, forearms, chops and slaps, and kicks him down and out the ring. Gulak is on the hunt, picks him up from the floor, chop him on the chest, throws him face-first into the ringpost, Cedric fights back, but Gulak headbutts him in the gut, throws him back into the ring and puts him in a chinlock. Enzo will not shut up at ringside. Alexander makes it back to his feet, Gulak with a snapmare, gets a 1-count, puts him in a step-over armbar. Alexander fights back, hits clothesline after clothesline, flips dives over the ropes with one of his legs catching Gulak on the head, and Enzo has a shocked look on his face. Alexander throws Gulak back in the ring, keeps an eye on Enzo, hits Gulak with a springboard clothesline and gets a near-fall. Gulak counters the Lumbar Check, rolls him up for 2, Alexander counters with a roll-up for 2, Gulak trips him up and a jackknife cover for 2, Alexander powers up and counters, Gulak avoids the standing Spanish fly, then turns him around with a lariat and gets a near-fall! Gulak gets fired up, picks him up, sets up for a suplex, Alexander blocks, Gulak tosses him onto the apron, Alexander springboard into a flatliner and gets 2.9! Enzo shouts for Gulak to get up while pounding on the ring apron. Gulak trips him up, applies an ankle lock, then switches to a half-crab facelock, Alexander reaches for the ropes, Gulak rolls him over, Alexander stretches and reaches and finally is able to grab the bottom rope. Alexander with a jumping kick to the head, Gulak rolls onto the apron, Alexander picks him up from inside the ring, they both climb up, Gulak fights him off, thinks about it with shaky legs, Alexander runs at him, catches his leg, pulls him off the ropes for the LUMBAR CHECK and gets the 1-2-3! WINNER: CEDRIC ALEXANDER. Enzo is staring wide-eyed at Cedric before checking on Gabba-Gulak. The champ jumps onto the apron, dances and yells at Cedric, and Cedric tells him to get in the ring. Ariya Daivari sneaks up from behind, but Alexander drops him with the Lumbar Check and tells Enzo it's HIS turn next. Enzo helps his fallen 'Zo Train members to the back as Alexander stands victorious in the ring.